The 1st generation Kunishige (国重) is considered to be the founder of the Hasebe school. There exists the transmission that he came originally from Yamato province, namely from Hatsuse (初瀬), which is located in Sakurai (桜井) in Nara Prefecture, about 20 km to the southeast of the centre of the city of Nara (picture 1). Hatsuse was later pronounced as „Hase“ and so it is assumed that the supposed family name „Hasebe“ of Kunishige (and the later name of the school) goes back to this place Hase, even if it is written with different characters (長谷部). 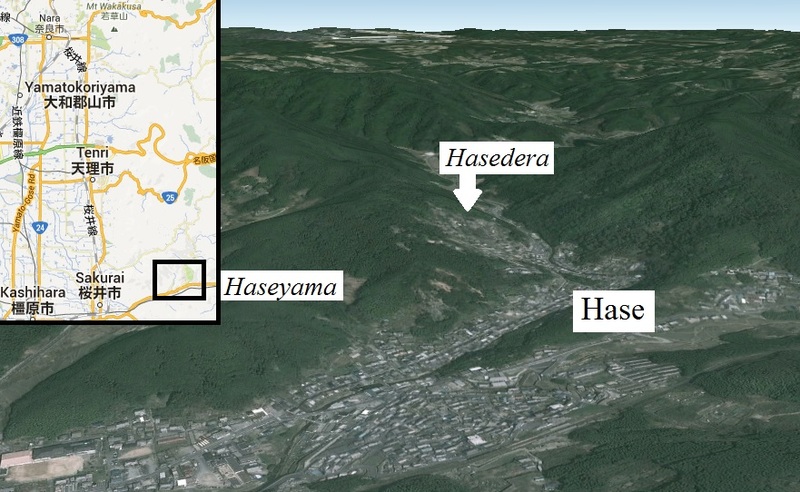 In Hase there is also the famous Hasedera (長谷寺) which in turn is written with the same characters for „Hase“ as in „Hasebe“. The little hill Haseyama on which the main hall of the Hasedera was erected in the 8th century is again written with the characters (初瀬山). That means it is safe to assume that all these names have a common etymological origin and the approach that Kunishige got his family name from that place can not be dismissed just on the basis of the use of different characters. Apart from that, this transmission says also that Kunishige was the son of Senjû´in Shigenobu (千手院重信) or that his roots were at least in the Senjû´in or the Taima school of Yamato. This Shigenobu is dated around Kagen (嘉元, 1303-1306) and the 1st generation Kunishige around Kenmu (建武, 1334-1338), what matches. Picture 1: Hase in Nara Prefecture (© Google Earth). But there exists another transmission on this family name. This transmission sees his origins in the vicinity of Shintôgo Kunimitsu (新藤五国光) who also bore the family name „Hasebe“. That means it is even speculated that Kunishige was the son of Kunimitsu. Well, as Shintôgo Kunimitsu was active around Shôan (正安, 1299-1302), Kunishige must had been a late son, an approach which is supported by this transmission. The meikan records by the way actually list a Hasebe Shintarô Kunishige (長谷部新太郎国重) as son of Shintôgo Kunimitsu. According to transmission, this Kunishige was active around Karyaku (嘉暦, 1326-1329) and it is said that he signed in his early years with „Kunimitsu“, the name of his supposed father. But most of the old sources list Hasebe Kunishige as one of the Ten Students of Masamune (正宗) who was also active around Karyaku. In any case, Kunishige was influenced by the Sôshû tradition and judging from the quality and production time of his extant works, probably direct and locally by one of the great masters of that time. From all the older and newer sources it seems that there were three generations Kunishige active, namely the first as mentioned around Kenmu, the second around Enbun (延文, 1356-1361) and the third around Ôei (応永, 1394-1428). In picture 2 I would like to present the entry of all relevant kotô-smiths with the name „Kunishige“ from the „Kokon-mei-zukushi“ (古今銘尽). Picture 2: The relevant passage on the Kunishige smiths reads: „Kunishige – Sôshû one person, Shintôgo; Yamato two persons, father and son; Higo one person; Bizen one person“ (國重　相刕一人　新藤五　大和二人父子　肥後一人　備前一人). After his studies in Sôshû, Kunishige moved to Kyôto where he settled in the vicinity of the intersection of the Gojôbômon-kôji (五条坊門小路) and the Inokuma-kôji (猪熊小路). 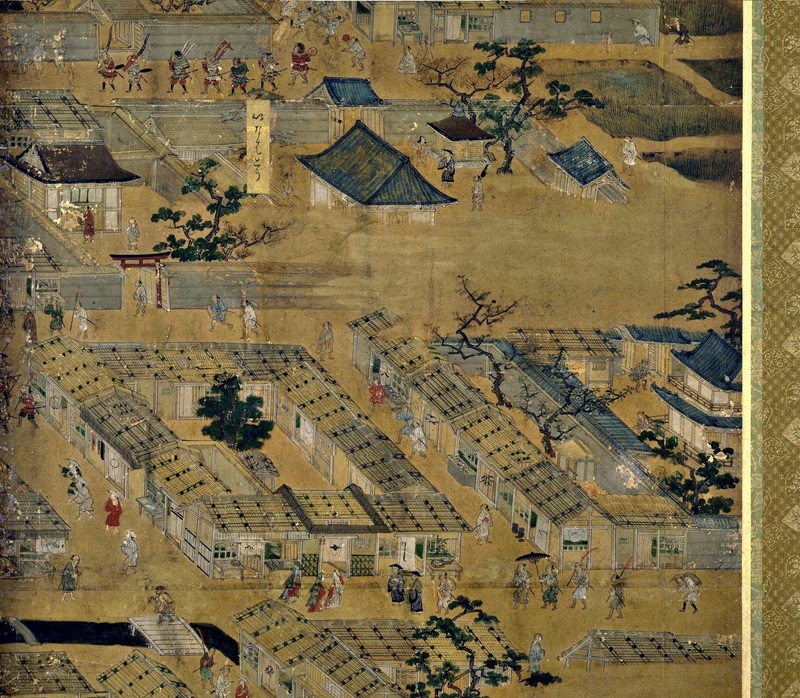 Fujishiro speculates that his leaving of Kamakura is connected with the destroying of the Hôjô clan, the former regents, when Nitta Yoshisada (新田義貞, 1301-1338) entered Kamakura in the second year of Shôkyô (正慶, 1333). This would match with his supposed active period. The Inokuma-kôji still exists today but the Gojôbômon-kôji was what is now the Bukkôji-dôri (仏光寺通). 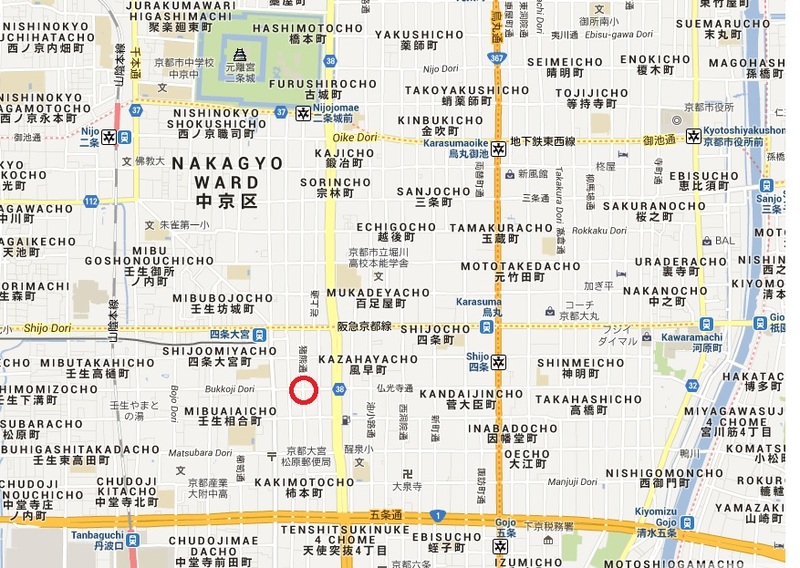 The intersection is located today in the Nakakyô Ward (中京区) to the west of the Horikawa-dori (堀川通り) and to the south of Nijô Castle (picture 3). A picture of that Gojôbômon road how it looked like in the mid 16th century can be seen in picture 4. It comes from a pair of folding screens with scenes from in and around Kyôto (rakuchû-rakugai-zu, 洛中洛外図屏風) dated Daiei five (大永, 1525). Picture 3: The intersection Inokuma-kôji Gojôbômon-kôji (© Google, ZENRIN). Picture 4: Detail from the right panel of the jûyô-bunkazai folding screen pair. Back to the Hasebe school. I did all this research when I was compiling our first Nihonto Club Catalogue in 2011 as it introduces a jûyô tachi of Hasebe Kunihira (長谷部国平). The research was done in order to gather background info for myself and was never meant to be in the catalogue for reasons of space. But recently this rare blade came into my mind again and I thought my blog might be a good opportunity to share the research in question. According to transmission, Kunihira was the third son of the 1st generation Kunishige and active around Enbun (延文, 1356-1361), but it is said that he had also studied under Hasebe Kuninobu (国信), the second son of the 1st generation Kunishige. The blade of our catalogue has an itame mixed with masame and a conspicious amount of nagare. The sugata is very elegant and does not look like Nanbokuchô-heyday at a glance. The hamon is suguha-chô mixed with a little ko-gunome and ko-midare and along the subdued nioiguchi we see ashi, hotsure, yubashiri, kinsuji, and sunagashi. The blade is tempered in nioi-deki but still with a considerable amount of nie, especially in the ha. The bôshi is sugu with a ko-maru-kaeri. This deki is quite different from what we would expect from a Hasebe work of this era and from Kunihira in particular, what would be namely a hira-zukuri ko-wakizashi in hitatsura, almost hitatsura or some kind of hako-midare (picture 9). 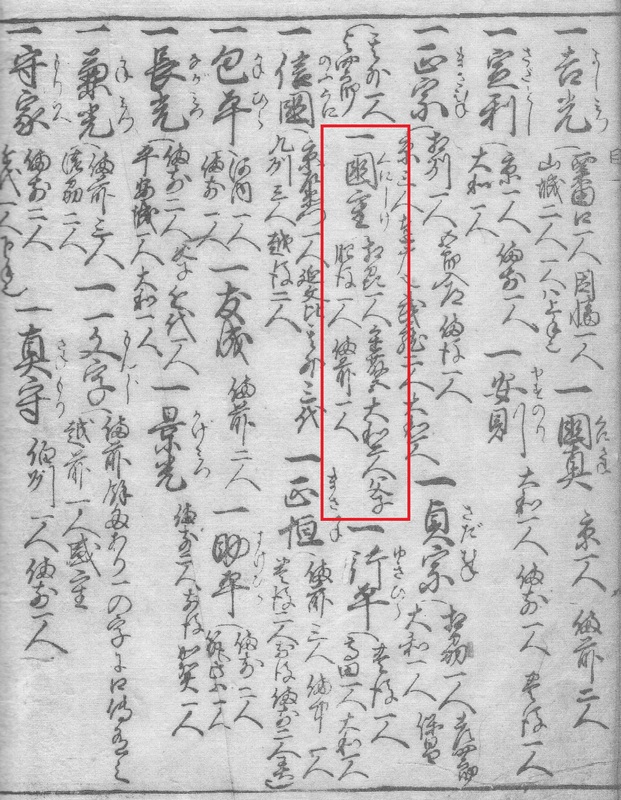 The jûyô paper says that it is therefore a very precious reference not only for Kunihira but because it is one of the very rare extant tachi of the Hasebe school. Also the paper mentions that it is similar to a tachi of Kuninobu which is preserved in the Tôkyô National Museum. 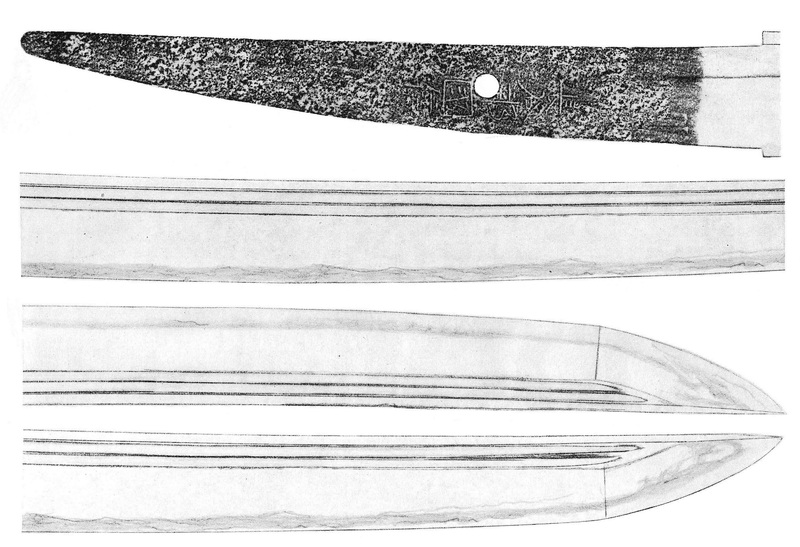 This tachi is shown in picture 5 and I will leave it to the reader to ascertain the similarity of the two blades. The Kunihira-tachi was also put out at a kantei session in Tôkyô of which I have the protocol. It says that there were neither atari nor dôzen and because of the itame-magare and the suguha-chô, most of the participants focused on Tegai Kanenaga (手掻包永) or went also for Ko-Aoe (古青江) or Naminohira Yukiyasu (波平行安). In the case of Kanenaga we would expect more Yamato characteristics, both in sugata and in the jiba. A Ko-Aoe work would show more nie and some jifu, sumigane and/or a dan-utsuri. Also an old Kyûshû work would show more Yamato characterstics. And as there are perpendicular ko-ashi, we can see some hints of the Yamashiro tradition but obviously most of the participants hesitated to go for Yamashiro as they would expect a densely forged kitae or a true nashiji-hada for a blade with that sugata and supposed production time. But the nie are not so intense as for example at Ayanokôji Sadatoshi (綾小路定利) or Ryôkai (了戒) and the tempering in nioi-deki speaks, according to this protocol, anyway for a later work than Kamakura. Picture 8: Another oshigata of the same Kunihira-tachi. Picture 9: „Typical“ work of Hasebe Kunihira. I recently contacted you requesting information on a sword that I recently acquired, and you told me the signature was that of Kunishige. But that there were several generations of them. My question is this, was it normal for a swordsmith to sign with only a name, and not with a date?